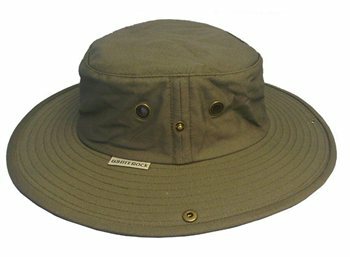 The White Rock Outback is a highly versatile cotton twill hat offering all-round sun protection with its wide brim, Hydro Cool crystals, Bug Off, passport security concealed pocket and adjustable chin cord. The hat is also water and stain resistant. The Outback X-Lite uses technologically advanced micro-fibre to reduce the weight of the hat by 30% and gives a great, soft feel to this lightweight hat with all the features of the regular White Rock Classic Outback hat. This is my second X-Lite Micro-Fibre hat from White Rock, having lost my first one, I immediately went and bought another one. I have had several other hats from White Rock in the past. This hat is a really good balance of light weight and strength. It copes with being stuffed into bags and still retains its shape pretty well. I have treated this one with a waterproofing agent, because it can get soaked in heavy rain. Det er min anden White Rock hat. Den første er slidt helt i stykker. Det er ca 7 år siden jeg købte den. Jeg havde fået et snit i panden, og min læge sagde at jeg skulle bære solhat om sommeren. Det har eg aldrig fortrudt. På den label der sad på min nye hat, tår der, at hvis den gamle hat er slidt i stykker, kan man få en ny gratis. Hvordan gør man det. Det kunne jo være godt med en ekstra. i've got an Aussie Leather hat for foul weather camping with my Scouts. needed something lighter for the Summer, it squashes flat, its light, its cool. just the job!!!!! !